Turkish investigators have entered the residence of the Saudi consul in Istanbul to gather more evidence about the disappearance of Jamal Khashoggi. Turkish officials suspect the Saudi journalist was killed during a visit to the consulate building on 2 October. The consul, Mohammed al-Otaibi, flew back to Riyadh on Tuesday. He denies knowing what happened to Mr Khashoggi. However, a Turkish newspaper says Mr Otaibi can be heard in purported audio recordings of Mr Khashoggi’s death. Earlier, US Secretary of State Mike Pompeo discussed the case with Turkey’s president and foreign minister during a visit to Ankara. Turkish Foreign Minister Mevlut Cavusoglu said the meeting was “beneficial and fruitful”. On Tuesday, Mr Pompeo travelled to Riyadh for talks with Saudi Arabia’s King Salman and Crown Prince Mohammed bin Salman, who he said “strongly denied” any involvement in the journalist’s disappearance. US President Donald Trump meanwhile cautioned against rushing to blame Saudi leaders, telling the Associated Press that they were being treated as “guilty until proven innocent”. Mr Khashoggi is a US resident and columnist for the Washington Post who went into self-imposed exile last year after reportedly being warned by Saudi officials to stop criticising the crown prince’s policies. What is the state of the investigation? On Wednesday afternoon, Turkish investigators entered the Saudi consul’s residence, about 200m (650ft) from the consulate, as part of the probe into Mr Khashoggi’s disappearance. The team reportedly included prosecutors and forensics experts in white overalls. 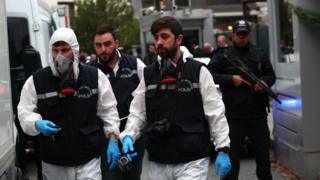 The search had been expected to take place on Tuesday, but it was delayed because the consul’s family were still inside, Mr Cavusoglu said. They eventually left Turkey on a commercial flight on Tuesday afternoon. Several vehicles with Saudi diplomatic number plates were filmed by CCTV cameras moving from the consulate to the residence just under two hours after the journalist entered the consulate earlier this month. Meanwhile, Turkish investigators quoted by two news agencies said the search of the consulate itself earlier this week had yielded more evidence that Mr Khashoggi was killed there. Samples, including soil from the garden and a metal gate, were reportedly taken. Mr Khashoggi arrived at the consulate at 13:14 local time on 2 October for an appointment to obtain paperwork so he could marry his Turkish fiancée. Saudi officials have insisted Mr Khashoggi left the consulate soon afterwards. But Turkish officials believe an assault and struggle took place in the building. They allege that Mr Khashoggi was killed by a team of Saudi agents who were pictured entering and leaving Turkey on CCTV footage released to media outlets. The New York Times reports that four of the 15 agents have links to Crown Prince Mohammed, while another is a senior figure in the country’s interior ministry. On Tuesday, G7 foreign ministers called for Saudi Arabia to conduct a “transparent” investigation into the issue.